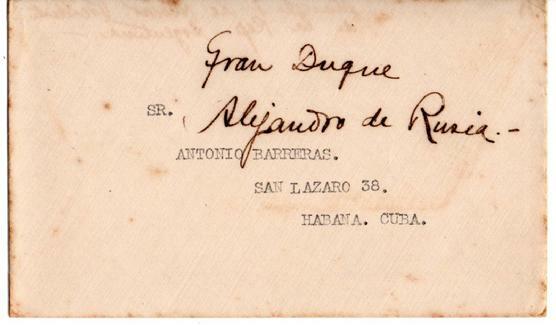 This is an ORIGINAL, vintage signature (Autograph) from the famous Russian Grand Duke Alexander Mikhailovich, on a 3x5 1/4 card with the envelope, while in exile, to an admirer in Havana, Cuba, dated 1924.Original and rare in great condition. Grand Duke Alexander Mikhailovich of Russia (13 April 1866 – 26 February 1933). He was a dynast of the Russian Empire, a naval officer, an author, explorer, the brother-in-law of Emperor Nicholas II and advisor to him. Alexander was born in Tbilisi, Georgia, the son of Grand Duke Michael Nicolaievich of Russia, the youngest son of Nicholas I of Russia, and Grand Duchess Olga Feodorovna (Cecily of Baden). He was mostly known as "Sandro". Grand Duke Alexander was a naval officer. In his youth, he made a good-will visit to Japan on behalf of the Russian Empire, as well as to the Brazilian Empire. He married his first cousin's daughter, Grand Duchess Xenia Alexandrovna, the eldest daughter of Alexander III on the 6 August [O.S. 25 July] 1894 and was thus a brother-in-law of the last Tsar Nicholas II, and was one of Tsar Nicholas's close advisors. His impact on the Tsar has been both criticized and appreciated: His memoirs document that he openly challenged the Tsaritsa Alexandra's political influence on her husband, but regretted that Nicholas did not use troops to resist the Russian revolution and admitted that he had been brought up to share the anti-Semitic views he claimed were prevalent in Russia prior to the revolution. His appeal to the Tsar, as his children approached adulthood, to relax the requirement for equal marriage for Romanov dynasts was rejected, and all seven of his children married titled but non-royal Russian aristocrats, although only his daughter obtained permission of the head of the dynasty to do so. He left the Crimea with his eldest son, Prince Andrei Alexandrovich and his new bride, Elisabetta Ruffo Di Saint Antimo, who was pregnant, in December 1918. His wife and mother-in-law, the Dowager Empress Maria Fyodorovna and his sons plus other Romanovs, were rescued from the Crimea by the British battleship HMS Marlborough in 1919. Alexander lived in Paris and wrote his memoirs. Once a Grand Duke (Farrar & Rinehart 1933) is a source of dynastical and court life in Imperial Russia's last half century. He also spent a time as guest of the future Abyssinian Emperor Ras Tafari. He talks about why he was invited to Ethiopia, in his continuation of his biography Always a Grand Duke. He died in 26 February 1933 in Roquebrune-Cap-Martin in the south of France. He was buried on 1 March in Roquebrune. His wife Xenia died in Hampton Court Palace in 1960. 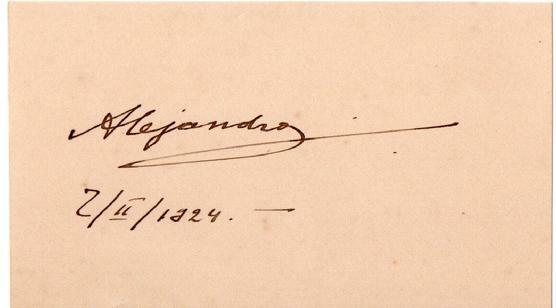 ITEM NAME: 1924 Grand Duke Alexander Michailovich Autograph.